Invulnerable Nothings' inaugural production matched Howard Brenton's Bloody Poetry with (un)Staged Readings from Lord Byron’s Cain, P.B. Shelley’s Prometheus Unbound, and Mary Shelley’s Frankenstein. 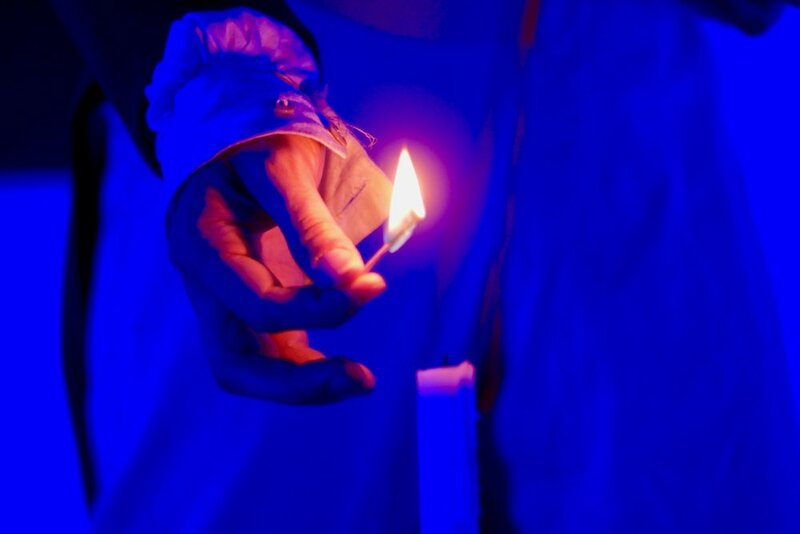 These performances in rep premiered in a sold out residency at The Brooklyn Art Library in August 2016, marking the bicentennial of the infamous summer of 1816. The production went on to tour nationally and internationally throughout 2017. Brenton's Bloody Poetry concerns the historical dramas and complex ménage à quatre of Percy Bysshe Shelley, Mary Shelley, Lord Byron, and Claire Clairmont from the summer of 1816 until Shelley's death in the summer of 1822. 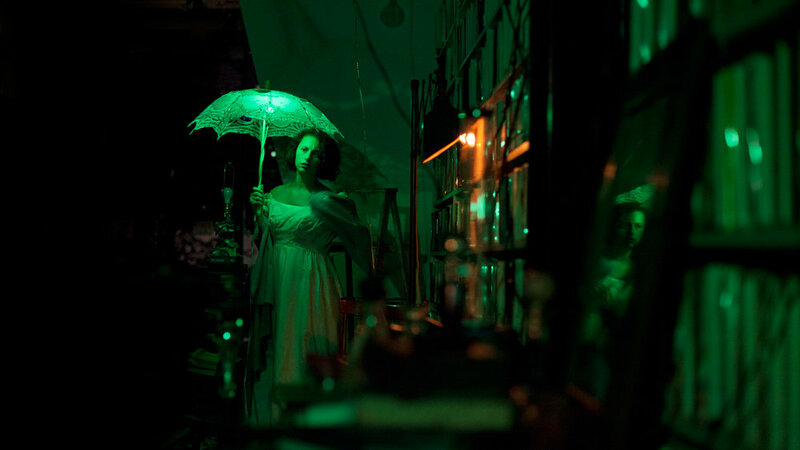 Invulnerable Nothings' highly interactive staging of Brenton's play was produced through Casarotto Ramsay and designed for small audiences in intimate, nontraditional theatre spaces, from a sketchbook library to a bi-level Victorian greenhouse. Bloody Poetry functioned as a fully realized theatrical counterpoint to The (un)Staged Reading Series, selections from Lord Byron's Cain and P.B. Shelley's Prometheus Unbound. These closet dramas’ production are expressly forbidden by their authors. The (un)Staged Reading Series sought to preserve the unique formal qualities of the closet-plays while involving their texts in a theatrically animating process: an 'audience' gathered together to silently perform mental stagings of the playscripts, the works remaining unvoiced but mutually accessible through physical text and live music. In 2017, Cain and Prometheus Unbound were joined by Mary Shelley's Frankenstein at its 200th anniversary, alternatively presented as actor-voiced selections underscored by live music. The two pieces operated together to explore the living mythologies of these three major Romantic writer, commemorating significant bicentennials of their work through expansive, installation-based residencies. 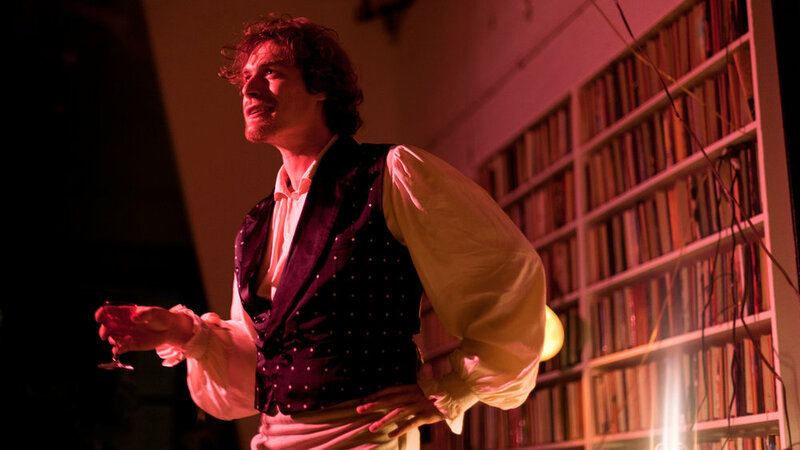 "a Romantic project of theatrical conjuring (...) the best theatre I've ever seen in this town, bringing Lord Byron and Mary & Percy Bysshe Shelley and their literary gang to fully blooded life, with note-perfect staging in the antique greenhouse of The Sekrit Theatre"
-The Leith Volcano with Volcano Theatre Wales for Edinburgh Festival Fringe, Edinburgh, Scotland (August 2017). Staged site responsively in and around a large scale gothic cruciform-plan church. The church's 19th c. pulpit was fully flooded during performances to create an artificial stage-lake. -Walcot Chapel Arts through the generous support of The Bath & North East Somerset Council, Bath, UK (August 2017). Staged site responsively at Walcot Mortuary Chapel in the center of an early 19th c. cemetery. Bath performances marked the bicentennial of the Shelleys' time living in the city, when Mary was finishing her seminal novel Frankenstein. Grave robberies from the Walcot Cemetery partially inspired her text. -The Garage International as part of Festival OFF d'Avignon 2017, Avignon, France (July 2017). Staged site responsively in a series of hotel rooms.One of seven English-language presentations to appear as part of the 50th anniversary festival. Staged site responsively in and around The Sekrit Theater's antique Victorian greenhouse. Pivotal research support was generously provided through The University of Texas at Austin's Harry Ransom Center, which opened its premier collection of letters and manuscripts from Byron and the Shelleys to the cast and creative team. Staged site responsively at The Brooklyn Art Library. Rehearsals and performances coincided exactly with the 200th anniversary of the group's time at Villa Diodati over the summer of 1816. Bloody Poetry was directed by the ensemble with Matthew Gasda. Lighting was by Joseph Medeiros with Anthony Delluva, and Anthony Delluva and Kit Sheridan served as joint production managers while on tour. The environmental set design was by Jacqueline Brockel, Beau Reichert, and the ensemble, with sound design by Joe Reynolds and costume design by Melissa Nelson and Emma Wollenskey. The cast featured Charlie Munn* as Percy Bysshe Shelley, Kristin Winters* as Mary Shelley, C.C. Kellogg* as Claire Clairmont, Vincent Santvoord as George the Lord Byron, Tate Rehklau/ Nico Bonacci as Dr. William Polidori, and Lauren Guglielmello as Harriet Westbrook (appearing courtesy of AEA/BAE). The (un)Staged Reading Series was conceived by C.C. Kellogg with the help of the cast and creative team. Special thanks to John Alfone, Matthew Armstrong, Anastasia Auber, The Bath and North East Somerset Council, Jaclyn Bethany, Lindsea Bevington, April Bingham, The Brooklyn Art Library, The Byron Society, Meredith Case, John Clark, Wendy Corn, Ashley Dennig, Steve Donie, Fractured Atlas, The Garage International and Shakti, Lawrence Gasda, The Harry Ransom Center, Kathryn Harvey, Hops and Grain, The Keats-Shelley Association of America, Coley Kellogg, Estee Kellogg, Anya Klepikov, Andrew Koger, Andrew Leisman and Julia Macalaster, Charlene & Tom Marsh, Erica McCarthy, The Metier Foundation, The Morgan Library, Michael Murphy, Suze Myers, Claudia Johnson, Mark Paredes, Marissa Passi, Steven Peterman, Amelia Raley, Beau Reichert, #Romantics200, Pamela Rose, Jessica Ryan, The Sekrit Theater, Jeremy Schroer, Tammy Starling, Alexandria Subia, Mary Anne Taylor, Irene Yardley, Jordan Tiberio, Tim Vasen, and Susan J. Wolfson.